Manufacturer & Supplier of Co2 Flooding System. 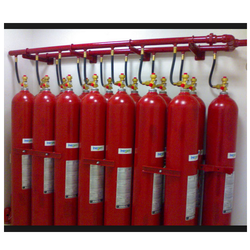 Our product range also comprises of Security Equipment & Systems, Boom Barrier and Fire Extinguisher. We are engaged in offering of Co2 Flooding System. Our High pressure CO2 system are used as total flooding systems in engine rooms, machinery spaces and cargo holds. The HP system consists of a number of CO2 cylinders, whose outlets are connected to a common manifold. This system uses CO2 as a fire extinguishing agent because of its high expansion ratio. From there, the CO2 is directed, via selector valves, into the various protected spaces. if the protected space is large, a high number of cylinders are required. We have developed our range using quality assured material and sophisticated technology.